Long before the first European settlers stepped foot into the New World, the Muscadine grape was growing wild in the wooded-areas of what would become known as the southeastern United States. These powerful little berries thrived in the harsh winters and blazing hot summers; without the interference or aid of the outside world. The Muscadine Grape: The King of the Super Fruit. Unlike traditional bunch grapes (vitis vinifera), that only have 38 chromosomes, the Muscadine grape (vitis rotundafolia) contains 40 chromosomes. This extra pair of chromosomes helps the Muscadine claim the title of the king of the super fruit. The Muscadine grape has over 100 powerful antioxidants that help neutralize free radicals and limit the amount of damage they cause. Each Mighty Muscadine product contains the power of these 100 antioxidants. From the supplement to the Muscadine juice, consumers can be confident they are receiving the most antioxidant available on the market today. Celsius. It's clinically proven to burn calories, reduces body fat, improves endurance and it increases muscle mass. It's enriched with vitamins and to top it all off it tastes great! 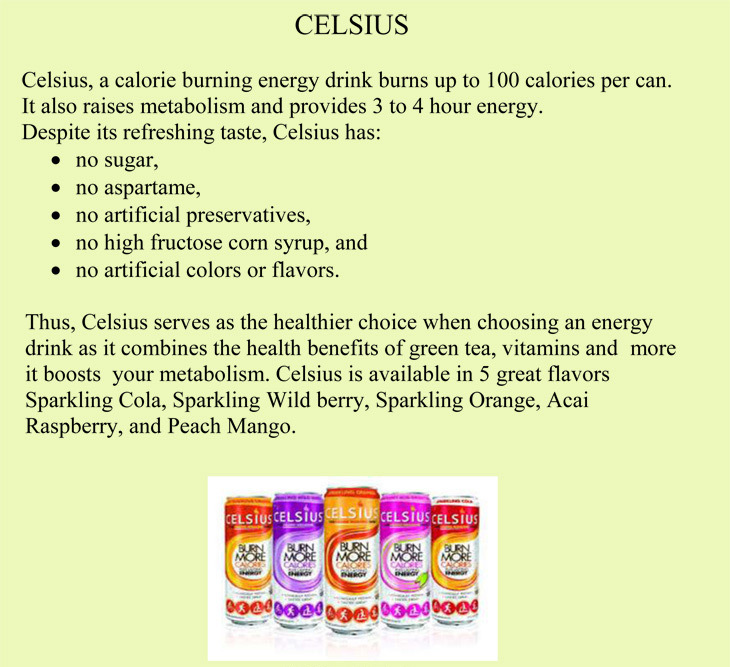 It has No sugar, No Aspartame, very low sodium, No high fructose corn syrup, No artificial colors or flavors and No preservatives. It's the smart choice! It comes in 5 different flavors. The case is $26.88 vat inclusive.